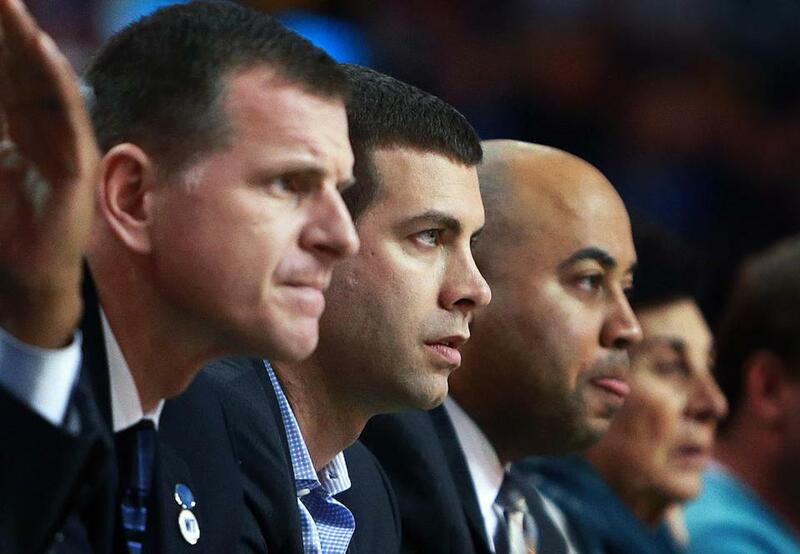 Micah Shrewsberry (right), on the job with Celtics assistant coach Jay Larranaga (left) and head coach Brad Stevens. Celtics assistant coach Micah Shrewsberry was this week’s guest on BostonGlobe.com’s Celtics podcast, “On the Parquet.” Shrewsberry took a winding road to the Celtics. He played for Division 3 Hanover College and had seven college coaching jobs before winding up in Boston. Q. How did you get to know Brad Stevens? A. “Brad and I have actually known each other since high school. He’s from Zionsville [Ind.] which is kind of a suburb of Indy, and I was in Indianapolis. We’d go through the summer AAU circuit playing against each other, and then open gyms. “We’re both hoop junkies, so you kind of knew the days and times people played. So we’d show up at Carmel High School on a Monday and play. You’d go to Ben Davis on Sunday. You’d go to Cathedral on a Thursday. Guys from the city would just rotate. Q. How would you describe Brad’s game? Q. What would you say to him when he did that? Q. After six years as an assistant, you became a head coach at Indiana-South Bend. How was that transition? Q. Sounds like it was easy to recruit. Q. Then it was off to Butler, where you reconnected with Brad. How did that happen? Q. What’s a story that kind of exemplifies that team’s back-to-back runs to the NCAA title game? A. “I remember the year we went to the Final Four [in 2010], we were a good team but we struggled a little bit. We lost a couple games in the nonconference and we were ranked really high early in the season. Q. The coaches did that? Q. The next time you guys hit a rut, you should say you want all the banners to come down from TD Garden, all the trophies. Q. What was it like to reach the NBA? Q. What falls on your plate as you prepare for a game? Q. What makes this team successful? Q. When practice ends and is opened to the media, we sometimes see these competitions and they always seem loud and intense. Subscribe to “On the Parquet” on iTunes here.